The Research Station Samoylov Island is owned and run by the Trofimuk Institute of Petroleum GeologyThe study of the solid Earth, rocks and processes by which rocks form. 'Geo' is derived from the Greek word for Earth.... More and Geophysics, Siberian Branch of the Russian Academy of Sciences. Access of international research teams to the station has been coordinated by the Alfred Wegener Institute, Helmholtz Centre for Polar and Marine Research (Germany). The Research Station Samoylov Island is located at the southern coast of Samoylov Island in the southern part of the Lena River Delta, Northeast Siberia, close to the Laptev Sea (72°22’ N, 126°29’ E). The Lena River Delta is the largest delta system in the ArcticDefinitions of the Arctic vary according to environmental, geographical, political, cultural and scientific perspectives. Some scientists define the Arctic as areas having a high latitude, long winters, short, cool summers,... More and Samoylov Island is part of the Lena Delta Reserve, the largest protected area in Russia. The nearest settlement is Tiksi, located about 115 km to the South-East, and home to c. 5000 inhabitants. Samoylov Island is situated in the youngest part of the Lena Delta in the zone of continuous permafrostPermafrost is frozen ground that remains at or below zero degrees Celsius (32 degrees Fahrenheit) for two or more years. It forms in regions where the mean annual temperature is... More. It covers an area of about 5 km2 and is dominated by wet polygonal tundraA type of ecosystem in which tree growth is limited by low temperatures. The origin of the word is from from the Kildin Sami word tūndâr, meaning "uplands" or "treeless mountain tract". In the northern... More, characterised by low-centered ice-wedge polygons. The regional arctic-continental climateThe average weather we would expect over a long period of time (seasons, years, decades). Climate varies from place-to-place across the Earth. Climate is determined by long-term (over at least... More allows maximum thaw depths of about 0.5 m. Hydrophytic sedges such as Carex aquatilis, Carex chordorrhiza, and Carex rariflora, as well as mosses (e.g. Drepanocladus revolvens, Meesia triquetra, and Aulacomnium turgidum) dominate the vegetation in the wet polygon centers and on their edges. Mesophytic dwarf shrubs such as Dryas octopetala and Salix glauca, forbs (Astragalus frigidus), and mosses (Hylocomium splendens, Timmia austriaca) dominate the polygon rims. The old wooden station was originally built as a logistics base for the Lena Delta Reserve. After its extension in 2005, it became an official Russian-German research station (in 2006), owned and run by the Lena Delta Reserve (Russia) and the Alfred Wegener Institute. In 2013, a new large modern Russian station, owned and run by the Trofimuk Institute of Petroleum, was officially opened. It replaces the old wooden station, which is, however, still used during the busiest field seasons in summer for additional accommodation and working space. The new station can accommodate up to 25 people year-round. The station building consists of three wings, which include the living areas, scientific laboratories equipped with numerous high-precision instruments, and workshop and storage facilities, respectively. The central part includes kitchen and dining room, conference hall, and recreation areas. The Lena Delta is a key area for studies of the dynamics and development of permafrost in the Siberian Arctic. The research focuses on the ecosystem-atmosphere interactions on various spatial and temporal scales in order to assess and predict climate environmental changes in the Lena River Delta region. The main objectives are to study the community, structure, and dynamics of microbial populations involved in the methaneA colourless, odourless gas (chemical formula CH4). Some microbesproduce methane. It can also be found in underground deposits. Methane is the main component of natural gas, which is is an important... More cycle as well as the processes controlling exchange of methane, carbon dioxideA gas (chemical formula CO2), which occurs naturally in the Earth's atmosphere. Carbon dioxide is given off by organisms when they respire, and it is absorbed by organisms like plants and... More, and energy on diff erent scales. Other important long-term studies focus on climate and permafrost monitoring, paleoenvironmental reconstruction, river hydrologyThe study of water in the environment, particularly its amount, movement and quality. It encompasses water in rivers, lakes, glaciers, soil and underground aquifers. The way in which water (liquid and... More, geomorphology, permafrost dynamics, arctic coastal dynamics, and hydrobiology (e.g. zooplankton dynamics). For more information see Hubberten, H.-W. et al. 2003 (published 2006): Polarforschung 73, 111-116 and Boike, J. et al. 2013: Biogeosciences 10, 2105-2128. Data and results from Samoylov can be found in the PANGAEA database (www.pangaea.de). 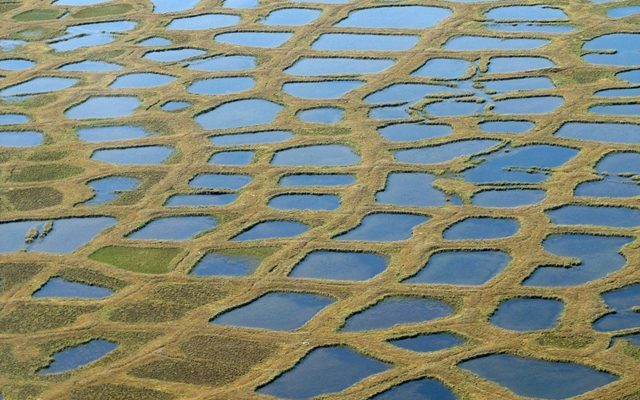 The human influence on the Lena Delta is minimal due to its status as a nature reserve with three rangers living in the reserve throughout most of the year. However, there is some subsistence fishing in the summer, and occasionally river cruise ships pass by. The Research Station Samoylov Island can be reached from Tiksi (connected by regular air service to Moscow and Yakutsk) by helicopter in about 45 minutes and by river boat in about 12 hours. Winter transport is also possible by truck or tank on the ice of the Lena River.